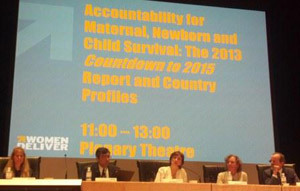 Countdown’s 2013 accountability report, highlighting core indicators selected by the Commission for Information and Accountability, was launched at Women Deliver 2013. Session speakers discussed new Countdown results and their implications for Millennium Development Goals 4 and 5, and for catalyzing progress and ensuring accountability. Better measurement of intervention coverage, through improved household surveys, contributes to stronger policies and programs and fosters accountability for delivery of essential reproductive, maternal, newborn and child health (RMNCH) care. This Countdown to 2015 session presented new research, much of it included in a PLOS Medicine collection published in May 2013, on measuring coverage for interventions across the RMNCH continuum of care, and the importance of tracking coverage indicators for global monitoring. Targeted efforts to reach poor and underserved populations can improve progress toward achieving the health Millennium Development Goals. This Countdown to 2015 session presented new evidence that addressing health inequities — by socioeconomic status, gender, age, place of residence, and urban/rural differentials in coverage — drives progress towards universal coverage of key interventions. Country Countdown processes, in-depth examinations of subnational health data enabling countries to assess progress and ensure accountability, are catalyzing action in multiple countries. At this session, Countdown to 2015 presenters shared lessons learned and showcased ongoing country initiatives to improve the use of evidence for decision making. Note: More information on Country Countdowns, including slide presentations given at a capacity-building workshop conducted at Women Deliver 2013, can be found here. Countdown to 2015 helps to hold governments and donors accountable by tracking the funding gap between current resources and actual investments needed to achieve RMNCH targets. This session highlighted new research on donor aid for reproductive health, domestic health financing in African and Asian countries, and lessons learned about performance-based financing strategies. Performance-based financing (PBF) to accelerate progress towards MDGs 4 and 5: What have we learned? The health of women and that of their newborns are integrally linked, making investments in maternal and newborn health all the more cost-effective. This Countdown to 2015 session discussed the impacts and costs — in terms of preterm births, stillbirths, newborn survival, and maternal health — of access to quality pre-pregnancy, pregnancy, childbirth, and postnatal care. Are stillbirths stillborn on the global agenda? Note: Additional presentations from this session will be posted here soon. For more information, visit www.globalnewbornaction.org.